NEWPORT, Ky. — When it hosts its grand opening on Friday, 27 Bar+Kitchen will introduce upscale cuisine on Monmouth Street in Newport. The brunch and dinner spot, named after Monmouth's state Route 27 designation, will operate inside a modern space that not long ago housed a thrift shop and tanning salon. “The goal is to be absolutely farm to table,” said Greg Gladman, one of the restaurant's four partners. Gladman designed the restaurant’s morning and evening menus, which include dishes such as biscuits and goetta gravy, frittatas, breakfast tacos, shrimp and grits, bourbon-glazed pork chops, blackened catfish and steak bruschetta. The veteran restaurateur previously spent 18 years in Columbus running places like the Northstar Cafe, which is now opening a new location in Liberty Township. Some of the produce will come from a community garden on Eighth Street in Newport. “I value fresh ingredients and consistency of service,” Gladman said. 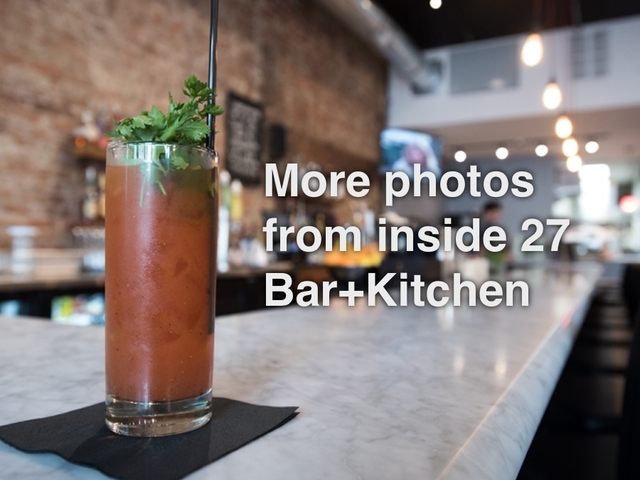 Gladman became involved with 27 Bar+Kitchen after friend and Newport resident Scott Quigley bought 720 Monmouth St. with a vision of opening a restaurant featuring a fun atmosphere and a solid brunch. “It is a passion project,” said Quigley, who found inspiration for his eatery while growing up in Los Angeles. Along with Gladman, Quigley also recruited partners Alex Ziegler and Colin Medding to round out the restaurant’s leadership. Ziegler brings mixology experience learned at Taste of Belgium and Metropole to the new restaurant’s bar. He recommends the restaurant’s signature house bloody mary, made with a special house brine, or the Gavel, a dinner cocktail made with Bulleit Rye, Fernet Branca, brown sugar syrup and orange peel. Medding handles the kitchen duties as head chef. He described 27 Bar+Kitchen’s menu as Southern food with an immigrant twist. Beyond his own creations, Medding recommends the shrimp and grits, a cheesy concoction that also includes smoked bacon, roasted jalapeno and scallions, or the pan-seared bourbon-glazed pork chop served with lemon and bacon Brussels sprouts. Most of 27 Bar+Kitchen’s menu items are priced between $7 and $16.